A beautiful, separate house for those who are looking for something other than a normal hotel room with balcony. The house is located in the village of Espinho, between Miranda do Corvo and Lousa, near the town of Coimbra. Here in Espinho, time stands still, many old houses characterise the image that makes it so attractive. In the village there are two bars where you can end the day between the villagers with a drink after a long day on the beach or in the city, here are really in the middle of Portugal, among Portuguese! If you want to cook for yourself, you can do your shopping in the well-stocked village shop, on Wednesdays at the market or in the big supermarket in Miranda. If you prefer to eat out, you can do so every day in one of the 20 or so restaurants in the area, the addresses of the best restaurants can be found in the house. However, it is advisable to book in advance. Calculate for dinner around 30 euros including drinks for two people. The beautiful beach of Figueira da Foz is about 30 minutes away and driving inland is very nice. Figueira offers a lot of bars, restaurants and nightlife. The old part of Figueira is Buarcos, with a beautiful wide sandy beach. We recommend arriving here at lunchtime. The historic town of Coimbra invites you to stroll through centuries of art, culture and architecture. In the house itself you can enjoy a beautiful view with a wonderful sunset. Behind the house, the forest invites you to hike and discover. In short, for young and old there is plenty to do here (mountain biking, hiking, fishing, swimming and sightseeing), for those who want to spend an exceptional holiday. Long-term tenants are welcome, pets by arrangement, extra charge. ATTENTION Master Bedroom 2nd floor , there is NO WC. Bathroom located on the ground floor, accessible via the spiral staircase! Final cleaning 25 Euro. Deposit 100 Euro. English-speaking contact on site for all questions! We bought our house in 2005. Since we live and work full time in The Hague, NL, we cannot enjouy the house as much as we want to. Therefore, we do rent it out to those who like and appreciate it! Real Portugal, country and friendly people. No mass tourism. Nature, culture, good roads and highways. Public transport in progress, own car necessary! Quiet and peaceful area, great restaurants, extensive footpaths biking trails, beautiful old villages. Special highlights: the famous chist villages Gondramaz and Talasnal. All available. Sufficient stock in trunk chest master bedroom 2nd floor. In front of the house, beside our garage. First floor, with wood stove, router, books, double sleeping couch. Completely equipped. Water kooker, microwave, koffee machine. Sheets and towels available. Please wash them bevoer leaving property hot water works on gas bottles. Available in the village shops. 2-3 gas ovens for room heating available. Beware! This house is not what it seems from the pictures and description. Be warned. There are numerous problems and unpleasant surprises with this place. The pictures and words do not adequately describe this accommodation. Here are some of the major surprises we encountered. • late information provided by host included a warning about the narrow approach road. With our side mirrors folded in we had about 3cm clearance on either side in many places on a significant stretch of road. This would make any excursion away from the accommodation after dark a significant hazard for damage to our rental car. • Late information provided indication of a parking space “in front” of a garage with a picture showing a garage with a car beside it. When we arrived, the space beside the garage was blocked off by a heavy chain, so it appeared not to be intended for us. So we had to park blocking the narrow road until we figured out what to do next. No one was there to greet us when we arrived. • The host refused any refund from our 4 days pre-payment. We spent two very relaxed weeks in the house, or mostly on the terraces. We fell in love with the setup of the garden and the lovely interior. The view is amazing and my personal highlight was the overall silence. Our 2.5 year old was also old enough to handle the many small stairs, and he loved the sheep coming by on the neighbours ground. We did only very little hiking, but the areas seems great for it. The hosts where easily reachable and helpful with upfront information and getting us an extra key during the stay. Small downsides: You might find the garden difficult for smaller kids running around. Once in a while the silence was interrupted by the choir of the village's dogs..
Wir , 2 Erwachsene und 2 Kinder, verbrachten eine sehr schöne Zeit in diesem wundervollen Ferienhaus. Das Haus liegt am Rand eines alten Dorfes, Espinho, mit engen Gassen und alten Häusern. Der Ort liegt am Berg und man hat vom Haus aus einen wunderschönen Blick ins Tal. Ein anspruchsvoller und sehr pittoresker Wanderweg verläuft direkt am Haus vorbei. Das ganze Anwesen bestand ehemalig wohl aus drei alten Häusern. Es ist komplett neu renoviert mit einer großzügigen Terassenlandschaft, einer grandiosen Eßküche und zwei gemütlichen Schlafzimmern. Das Haus ist mit allem ausgestattet was man braucht und noch ein wenig darüber hinaus. Sehr großzügig und urgemütlich. Es gibt gute Restaurants, wunderbare Naturflußbadeanstalten und schöne Regionalstädte. Ideal für Leute die gerne wandern, gut essen wollen und Portugal von seiner wahren Seite kennen lernen wollen. Man sollte ein Auto haben, möglichst nicht zu groß. Wir hatten einen wundervollen Urlaub, danke! Die Lage ist sehr schön, einsam, mit einem super Blick in die Berge. Die Zufahrt zum Haus ist wirklich eng aber zu schaffen. Der Kontakt war sehr nett und immer verfügbar. Das Haus ist mit allem ausgestattet was man braucht, evtl fehlt ein Backofen aber wir haben ihn nicht vermisst. Die Umgebung ist sehenswert. Wir haben einige der Flußschwimmbäder aufgesucht, in der Nachsaison sind die meisten ohne Bar oder Gastronomie aber dafür hat das Becken fast für sich alleine. Falls möglich werden wieder kommen. Fully renovated stone house in Espinho, close to Silver Coast and about 20 km south of Coimbra. Espinho is an old village with very friendly neighbours, tw0 bars and a grocery shop for all daily needs. Bread is daily delivered to your door! 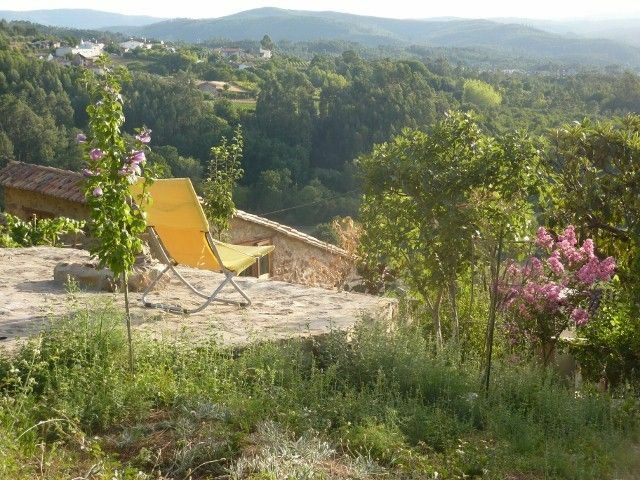 Our house is located on a hill near the forest, from where you can enjoy a beautiful view onto Miranda do Corvo and the mountains of the Serra da Lousa. Lots of shopping and leisure facilities in Miranda and Lousa (3 and 5 km far). Lots of natural swimming pools (piscinas naturales) all over the area. The highlight is Figueira da Foz, a seaside resort on the atlantic coast about 35 minutes away. Location and surroundings offer a lot to those who love unspoiled nature, but no mass tourism. Besondere Preise gelten bei Langzeitmieten ab 1 Monat. Per Aufenthalt 50 Euro Reinigungskaution, die bei ordnungsgemäßer Übergabe der Wohnung umgehend rückerstattet wird. Waehrend des Aufenthaltes anfallende Verbrauchskosten wie Holz oder Gasflasche (25,- per 18 Lt.) zu Lasten Mieter. Special rates per month upon request. Per stay 50 Euro deposit which will be reimbursed if all is ok.